HARDBOUND014 is a child’s hardcover storybook looking down on the book from 45° and rotated to 30° on the flat surface. This PSD Mockup takes the supplied sketches or finalized artwork and begins to render a children’s hardcover story book placed on a flat surface with a view looking down at the final product. The final render is a full-page spread at the centre of the book — your design could represent 2 entirely different pages or 1 continuous design spanning both pages. 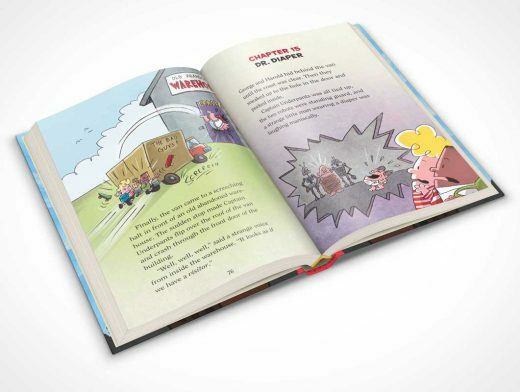 Although the hardcover book was modelled after a real-world product, it is important to note that designers should approach this product as a proxy for a hardcover children’s book with similar characteristics. The book on which this product was modelled contained 100 pages (200 double-sided) and measured 5.6 inches in width and 8.2 inches in height with a solid hard cover (no sleeve) and a glued spine.